I’ll be honest, I’m a Philistine. I don’t care for organized sports. Not a bit. Therefore, the fact that I am writing this should demonstrate the magnitude of what is happening at this year’s Super Bowl. In an historic move, this year’s Super Bowl will feature a Social Media Command Center, and I’m not talking five geeks in a basement, either. While the game is a one-day event, the Command Center will be up and running for about two weeks and will mainly be concerned with serving the Indianapolis area. The goal of the social media center is to act as an information hub for people coming to see the game. A staff of 50 has been assigned to scan Twitter, Facebook and other media for Super Bowl related questions. Since they’re specifically dealing with those visiting the Indianapolis area, it’s not as massive a job as it could be. The secondary function of the center is one they hope they won’t need, that of emergency management. The staff is prepared to send out emergency information via Twitter in order to quickly reach a large portion of the 150,000 fans at the game. Raidious’ staff of 16 is teaming with a group of volunteers to monitor the communications hub — and add to the conversation. All told, about 50 people will spend time in the command center, including researchers from Ball State University’s Center for Media Design, Butler University and IUPUI. About 150,000 visitors are expected to converge on downtown for Super Bowl festivities. Volunteers will respond to fans in need of assistance by indexing keywords and phrases used by those visitors in social media conversations. Guests searching Twitter for destinations or parking and restaurant options, for example, should receive responding tweets from the throng of volunteers tracking the digital dialogue. Anyone who has tried to use Facebook or Twitter during a game knows there is an explosion of status updates, often quite colorful ones. Last year’s Super Bowl, with no command center driving engagement, saw a dizzying 4,064 Tweets per second (TPS). Not quite the all-time record of 6,939 TPS that we saw as the Japanese welcomed in the New Year, but still vastly more than any other sporting event on record had produced. That stunning fire hose of data is about to get a boost. It will be interesting to see what sort of engagement numbers we see once we are viewing the game in hindsight. 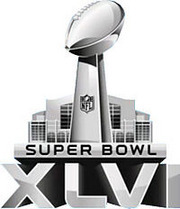 Image: Super Bowl logo, used under Fair Use: Reporting.